CodeMirror is pretty awesome and it powers both JSfiddle and CodePen. 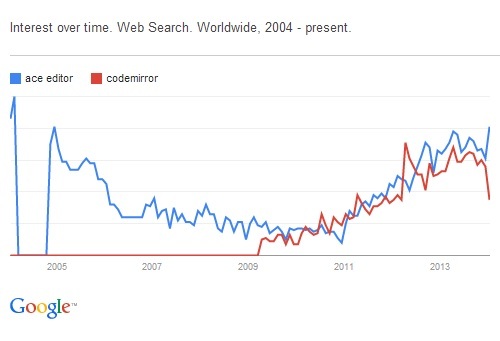 Here is a list of all the tools and websites that use CodeMirror and it is the first library I have tried. There are a ton of demos, good documentation, and a nice compression helper. I took a look at all the demos and built a simple example that will allow me to drag and drop files, directories of files, and even archive zip files into the browser and I can visualize the contents of files, or code, with CodeMirror (version 3.18). I also added a “view raw” feature that creates a blob object with FileReader and let’s you render any file in a new browser tab or window. Finally, I leveraged ZeroClipboard to easily allow copying of source code to the clipboard. Overall, I like CodeMirror and the only performance issues I have encountered happened with big files and special options like line wrapping, which makes sense as I was testing a large minified file. Next, I tried Ace editor. It powers GitHub, Mozilla Add-On Builder , and a lot more. It also has great documentation, API reference, and guides but I really love that it comes with a kitchen sink example. Also, it’s pretty easy to get CodeMirror to work with Emmet (Zen Coding) but Ace Editor has an official example.